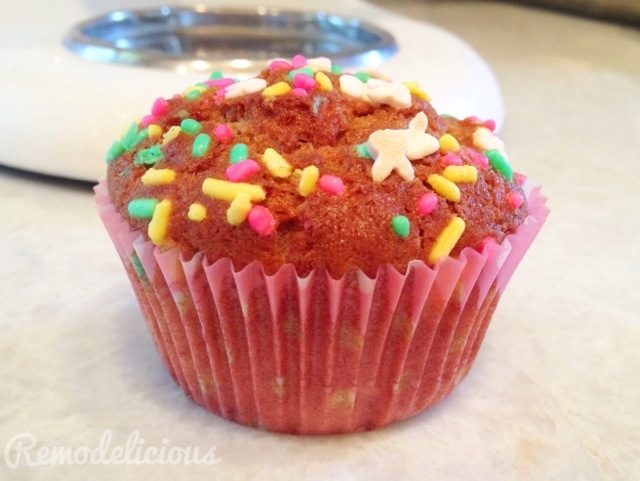 These yogurt banana muffins were a serious hit. We used Chobani strawberry-banana greek yogurt yogurt and left-over Easter sprinkles. The girls loved them and I loved them as well. We loved them so much that the first batch was gone almost instantly and we found ourselves making another batch a couple days later with plain vanilla yogurt. These are semi-nutritious so I don’t feel so guilty letting the girls devour these and they are good enough that I can join in (even without frosting they are just sweet enough!). Just don’t tell Chloe that they aren’t cupcakes – er “pupcakes”. Absolutely! It’s a winner at our house! These look delicious! I am going to make some for my son. I know he is going to love them.